Some time ago a family arrived to our church from Mexico. They had many problems and needed help for food and rent. Our office started to move so they could receive food from the Food Bank and also financial help with the rent. Since that day we began to establish a great friendship with him and his beautiful family. At the Hillsboro Spanish Seventh-day Adventist Church, we have initiated an aggressive program that is giving small groups great results.We talked to them about the possibility of joining a small group to study the Bible and they agreed. After attending for about three months, I met with them asked them if they would make a commitment to Jesus. This family decided to give their lives to Jesus that day! That Saturday was a spiritual feast for all who met in that group. They gave thanks that God used the group leader as an the instrument to help bring the family to Christ. At the same time, we had 4 youth fighting to know the gospel. We started to visit with the young of the church and invited them to youth events and youth services. We began to study the Bible with the boys and a few weeks after they also decided to give their lives to Christ. Today, a few months after, they are attending regularly, coming to all the programs and happily participating in church activities. Now the oldest daughter is a leader and coordinator of her own a small groups. Their prayer is to see their grandfather and aunt baptized and accepting of the gospel. 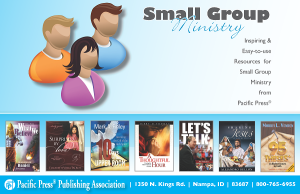 Looking for GREAT resources for small groups and prayer meetings? View a wide range of topics, most books with built-in study guide questions. CLICK HERE to browse the 16 page digital catalog. CLICK HERE to download a PDF version of the catalog! Why Not Try This? 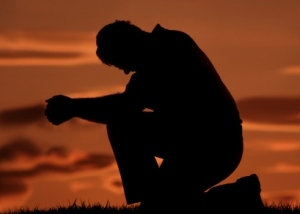 – Why Men’s Prayer? Why should men pray together? Especially, why should men group together to pray (at certain set times) only with men? Shouldn’t our prayer meetings reflect our heterogeneous, mixed-gender society and Christian community? Certainly the Jews and ancient Armenians separate men and women for times of prayer, but should we, Bible-believing Christians have meetings with only one gender represented? The Bible instructs men to lift up holy hands in prayer – should not this be read as generic ‘people,’ ie ‘men and women’? The benefit of praying together at certain times as men lies partially in the fact that men are put together differently to women – seeing the world through ‘masculine’ lenses – perhaps less intuitive than women, focusing instead on the structure of a problem, its relationship to other issues, and moving swiftly to proposed solutions. On the spiritual level men are more naturally warriors and can delight in spiritual warfare rather than simply enduring it. Comments Off on Why Not Try This? – Why Men’s Prayer? Filed under Prayer, Small Groups, Why Not Try This? The Milton Spanish Church prepared themselves since the beginning of the year by giving classes to the lay members. They later formed into four small groups in which the members helped and invited their neighbors to be present in their homes. The material that was being used was named “Disciple” along with the DVD that had songs and the topics of the book that was written by the Oregon Conference Coordinator, Roger Hernández. The Bibles studies took place in the small groups every week throughout the whole year and the Bible Worker was helping in the preparation of the meetings, making sure that each small group leader took responsibility. During the evening meetings each small group leader took charge directing the program and they each brought the guests who previously had attended their small groups. Also during the meetings they were giving away Bibles, books and music on DVDs to encourage the church members and guests to attend the meetings each night. Sunday evening Shane and Amy’s small group laid hands on Shane and pleaded with God to give him a different job. He worked as a sales representative for Pepsi, but delivering those cases of pop was killing his already-bad shoulders. He was their top salesperson, winning yearly awards for sales, etc. But Shane just couldn’t continue—and yet he didn’t know what else to do. He had a family to support and couldn’t afford to be off work. For Shane, the love and support of his small group that evening were a gift. The next day when Shane arrived at work at 5:00 a.m., his boss called him into the office and fired him. Although a bit confused as to why the company would fire a longtime, model employee, he walked out with a smile on his face, thinking, I wonder what God is up to? Getting Shane to that place of comfort in the midst of the storm was quite a journey. It all started in the spring of 1998. I received a call from the Rocky Mountain Conference to do something I was very passionate about for nearly six years: to plant a church in northern Colorado with an evangelistic approach. It was an opportunity to see if what I said either worked or didn’t work. I had been on the development team of two other church plants, and as a kid was baptized in a church plant. But I wasn’t sure what to expect. On Saturday October 10, 2010 we began 3 small group evangelistic meetings in Mattawa Spanish Church member’s homes. An average of 5 visitors went to each group meeting. On Saturday October 15, we continued the evangelistic meetings “A Life Change” in the Mattawa Public Elementary School Gym. The first night the Lord blessed with 18 visitors and the second night we had 24 visitors and every evening afterwards the Lord continued to add new visitors. 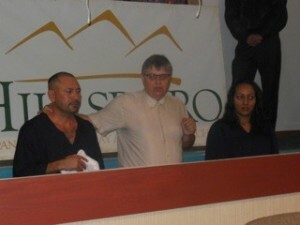 By God’s grace over 45 visitors heard God word preached (by Pastor Gerizin De Pena) for the next 8 nights. We would reward visitors with “gift boxes” of food which where donated by the Grandview Adventist Food Bank (which have been donating 10 bags of food weekly to the Mattawa Spanish church members for the past few years). We would also reward visitors with cds and books. Since 100% of the congregation was Mexican, special music was held by different artist and groups (including Mariachi, Pablo Uzua, Cantando por amor Trio). We had Dominican Pastor, Angel Rijo, whom dedicated his yearly vacation time to come and help during this week of evangelism. He visited, gave Bible studies, prayed, baptized, and also sang special music. We felt that the Lord had specialy chosen him for this time of evangelism. By God’s grace 9 people gave their lives to Christ. I was convinced once again, through my conversation with another self-fulfilling prophet of failure, that the greatest barrier to reaching American society with the Seventh-day Adventist message and movement is not in the minds of pre-Adventists but in the minds of some Adventists! Since I’ve had the privilege of traveling to many parts of the world where the Adventist movement is growing rapidly, I have collected ideas and experimented with them back home in the US. Where they are used with flexibility they work here, too! As this post is published I’m in Peru with 85 Americans, preaching in 52 sites throughout the city of Trujillo. Besides helping with soul winning I hope we are training soul winners for back home that have the faith to believe that God will use them to make a difference on both continents. Filed under Church Planting, Global Missions, Outreach, Pastoring, Small Groups, Soul Winning, Why Not Try This? Pastor Jim McMurray (jimmcmurry@gmail.com), Senior Pastor of Hood View Seventh-day Adventist District (Oregon Conf) has adapted an idea he used while pastoring in Sonora, CA to divide his congregation into 24 geographical parishes. Each of his 24 elders (that’s Biblical isn’t it!) gets to know the members in one of the areas, makes visits and delivers materials from each church family’s mailbox slot, and encourages a small group to start, whether led by him or one of the members who lives there. Watch more from this video clip filmed while he pastored in Sonora. 140 Trained & Equipped to Give Bible Studies in Eugene-Springfield Metro area. On Sabbath afternoon, May 16, one hundred forty Adventist believers from Eugene-Springfield, Oregon area churches gathered for “Share the Light” small group Bible study training in preparation for Momentum meetings by Jose Rojas in September. At the conclusion of the four hour training 88 signed up for a Starter Kit, three Bible study interest cards and committed themselves to begin a Bible study group within the next two weeks. Four weeks earlier 100k Bible study invitation cards were mailed to the Eugene-Springfield metro area with over 465 responses to date. Spanish Satellite Reaping Series from Portland this October. Spanish SDA churches across North America are preparing for a great harvest the week of October 24-31, 2009. During that week a satellite series will be broadcast on La Esperanza TV featuring Ramon Canals, NPUC VP for Hispanic Ministries, preaching to a live audience in the Portland, OR area. Boise Metro Evangelism & Field School this September. Seventh-day Adventist Churches in the Treasure Valley, ID (Boise metro) are preparing for a major evangelistic series this September, including a field school of evangelism, featuring Ron Clouzet, Ministerial Director for the North American Division. Youth for Jesus at Gem State Academy, Idaho. “More sermons, more Bible studies, more evangelism…and we as a staff are trying to figure out how to make it happen,” says London Lee, Gem State Adventist Academy chaplain. He’s talking about the students’ response to Youth for Jesus, an ASI-sponsored program just concluded on the GSAA campus. For over five months, students, faculty, churches and the community have experienced a powerful renewal and transformation. (Read More).